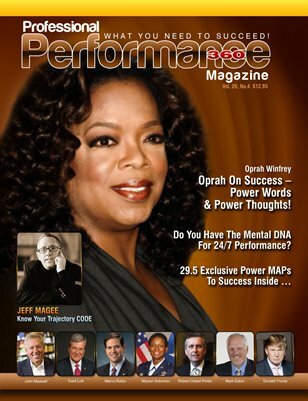 PERFORMANCE/P360 Magazine - What You Need To Succeed - A magazine of powerful how to oriented success articles written by power personalities for your exclusive mental DNA. In this Edition exclusive success, achievement focused article’s from: Oprah Winfrey, Bill Bartmann, Dean Brenner, Berny Dohrmann, Mark Eaton, Kent Healy, David Horsager, Robert Johnson, Nadine Lajoie, Paul Lemberg, Pam Lontos, Senator Trent Lott, Harvey Mackay, Jeff Magee, John Maxwell, John Montgomery, Larry Myler, Chief Robert Odawi Porter, Crystal Ramsay, Senator Marco Rubio, Gen. Allyson Solomon, Lauren Solomon, Jim Stovall, Brad Sugars, Joe Cobb and Leigh Ann Taylor, Donald Trump, Alan Weiss, Zig Ziglar. For a beautiful color copy, go to www.ProfessionalPerformanceMagazine.com and order your hard copy today … Or order gift copies for someone you want to make a mental investment in NOW!